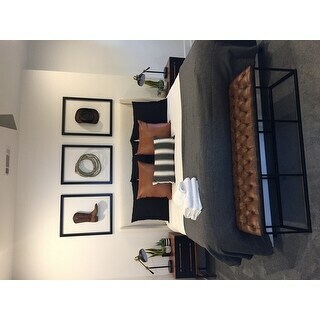 I recently redecorated my guest bedroom, and purchased all new bedding and pillows from Amazon! I was amazed at the price, quality and fast service!! These pillows are the finishing touch on my new queen bed, I can change the pillow cases too match any design, it’s the perfect solution!! Slip into the ultimate slumber with these square pillows, ideal companions to your standard pillow. 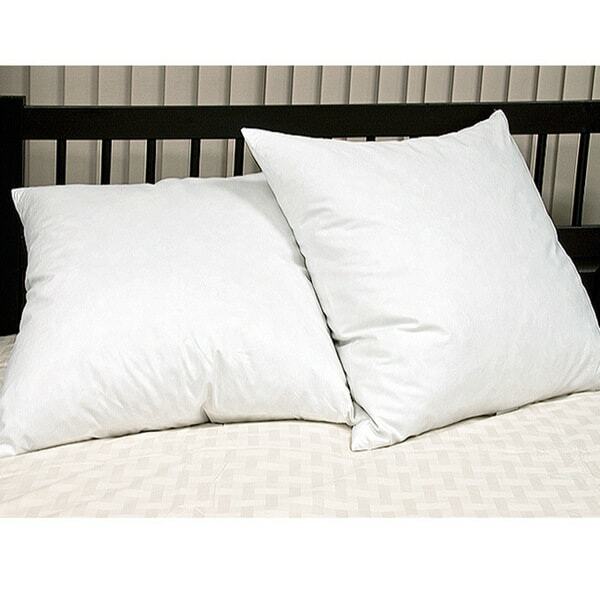 These feather pillows have 50 ounces of fill for a plush, pliant surface to rest your weary head, and the 100 percent cotton cover is soft and welcoming. So disappointed! The covers are 26"x26", as stated, but the filling is barely enough for a small standard pillow. Even after a good fluffing they remain limp, with too much air space. Fortunately, I can sew and I plan to plump them up with extra fiberfill so I can use the 26" square covers I had planned to put on them. But that shouldn't be necessary. Great pair of pillows for the price! Wonderful down filled pillows! They are really fluffy and fill up a 26" sham. I was a little hesitant to buy them because the description said to fluff them for a week to get them fluffy - I thought that meant that they would be on the flatter side with not much down filling, but the first day I fluffed them several times and they were super fluffy with even filling and the pillow sham is filled out and looks really pretty with this pillow inserted (I have shabby chic ruffled shams and they are the perfect inserts). I was very pleasantly surprised with these and would recommend them. These down pillows are super comfortable and when you lay on them and they get flat, just give them a good shake and they look good as new! Great deal for the money and super fast shipping by Overstock. Should I need more inserts, I will buy these again. Love these European pillows! Quality construction and enough fill for a fluffy pillow. Makes a great overstuffed 24x24 fill or fills out its 26x26 size as expected. Feathers do not poke out of their housing let alone through the case. Would buy again. These are quality pillows. However, I bought them for decoration, for my bed, as the two main supportive Euro pillows behind the rest of my my pillows (3). Given that they are feather-filled, they don't hold their square shape very well, and need to be fluffed and reshaped a few times in order to look like the ones pictured. So, that's why I gave it 4 stars. These European Square pillows are a great buy! They are the perfect size and weight...I will be using them as accent pillows with shams. They arrived vacuumed sealed and packaging was great. Not at all like the photo! I wasn't very happy when I got these. In Overstocks defence, I did glance over the description that these are down-filled pillows. 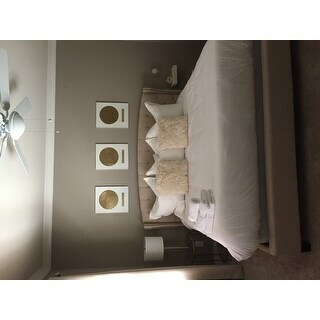 However, in my defence I made my decision based on the photo, which shows the pillows bascially standing on their own. So, I assumed these were full/thick, "pillow forms" that you use to stuff shams for decorative purposes, but they are not. They are the typical, non-shape holding down pillows. These are being used to stuff Euorpean Shams that are leaning/standing against a headboardbut they just dont do the trick. They don't hold their shape, they colpase into a pillow puddle! So, if you need a pillow-form to hold the shape of a sham for decorative purposes like you can get in other stores, don't get these. Also just as a side note -- these pillows are not stuffed very full -- they are really only about 1/2 to 2/3 full. So, again, the picture is completey inaccurate. I ordered a set of the 26 inch european pillows and i they are perfect. They fit my pillow cases and they look really nice with my bed set. They are also very comfortable pillows. They were delivered in a very timely manner as well. LOVE, LOVE, LOVE these pillows. They are extremely soft and plumpy. They seem true to the size of a traditional European Square pillow. I would recommend this item to anyone. Very nice pillows. They fit the 26 inch pillow shams I purchased at the same time. These pillows were too soft, would not stand up. If you want firm pillows for decorations, these are not what you are looking for. Sent them back. They appeared to be of good quality, just not what I was looking for. I should have paid attention to previous review. These were thinner than I thought they would be...they pillow on the left of the photo looks very plump...but the pillow on the right of the photo is more of what it really is like. Looks great in the sham!!! The pillows were not what I expected. They collapse too easily, and they do not stay upright on the bed. You have to continously position it so it doesn't sink in. Very pleased with these pillows....great value for the price. I would have liked them to be a little plumper but again, for the price they are a good buy. I purchased these for my bed. It's a queen sized bed -- I would recommend getting two sets as three of these pillows across the back is perfect. I keep the fourth on my couch, which works out perfectly for those evenings when I want to lounge while watching a movie. The pillows are very comfortable and fluff up nicely. Good pillows but wished I'd ordered down not feather. The pillow doesn't fit the sham well enough as the feathers within fall to the bottom therefor I think the down would have stood up better! These pillows are exactly what i expected them to be. Not too firm not too soft. They fit the European shams i purchased earlier on this site. Look great on our bed. Bought these pillows to use for Euro Sham filler; however, pillows are too soft and won't stand up on the headboard. Recommend if looking for a soft pillow, but not for use as a decorative pillow. Nice feather pillows. I though it will be more fuller based on the picture showing. Very Skinny flat pillows so I'll have to fill it someway. nice pillows for the money.......they are weighty and lofty. Buyer beware they are feather only which still makes for a nice natural pillow. Pillows were not as full as I was expecting, but I haven't had feather pillows in years so that could be normal. They came vacuum sealed, hard to believe both pillows were in there. Bought these for my new bedding set. They are good however, I wish they were a bit fuller...but that could be because they are feather. I maybe should have gone with non-feather pillows. Nice and fluffy. Keep shape and do not get flat. "In description it says Firmness: Medium Pillow Firmness: Soft So what does it mean. Is pillow Medium or Soft ?" They are medium because they are all feathers. Good for support on a couch or behind softer pillows on a bed. "I would like to cancel our order please. Not sure how. Thanks"
Hello mrjohn, you will be contacted by Customer Care. Have a great day. The price point is perfect!! "Where are these pillows made?" The pillows are made in China. feathers and down. I bought them to stuff two Indian embroidered pillow covers. "50 oz fill per pillow? based on reviews i'm skeptical it is this high. please confirm it's claim is for a single pillow vice fill total for both pillows. thanks!" This does have a 50 ounce fill power. 50 oz for a single pillow. The fluff is good but if you want a super firm decorative pillow in the sham then use two which is what I have down and you will then get a designer look like in AD. "what is the fill power of this product?" This is 50 ounces of fill.